Lodge at Sun Ridge in Surprise Arizona near Phoenix. The Lodge at Sun Ridge offers an unbelievable opportunity to enjoy the splendor of Arizona at incredibly affordable prices. 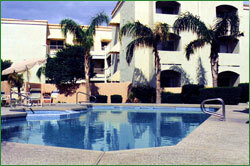 These quality, furnished, resort condominiums were built in 1987. Our deluxe condominiums offer "like home" living accommodations, with washers and dryers in each unit, for short term or extended stay. Of course, Arizona offers some of the most beautiful and diverse scenic areas in the world... ranging from snow capped peaks to fragile desert environments having some of the most lovely mountain lakes for fishing or relaxing you will find anywhere. Whether you enjoy planned group activities or just touring on your own, you will find unique unending joys to see.